A better breakfast routine is something that I've struggled with for years. I've never seemed to quite eat enough to keep me satisfied throughout my mornings which is basically a recipe for disaster. I'd rummage through my desk, the vending machine, my purse, just about anything trying to find a mid-morning snack to satiate my hunger. Last week, I tried a new routine and a childhood favorite: a heaping bowl of Cheerios and a tall glass of 100% Florida orange juice. It's such a simple way to fuel your day without having to think about it too much. What's not to love about that? According to lots of research out there, breakfast is the most important meal of the day which is why it's so important to start your day off strong. 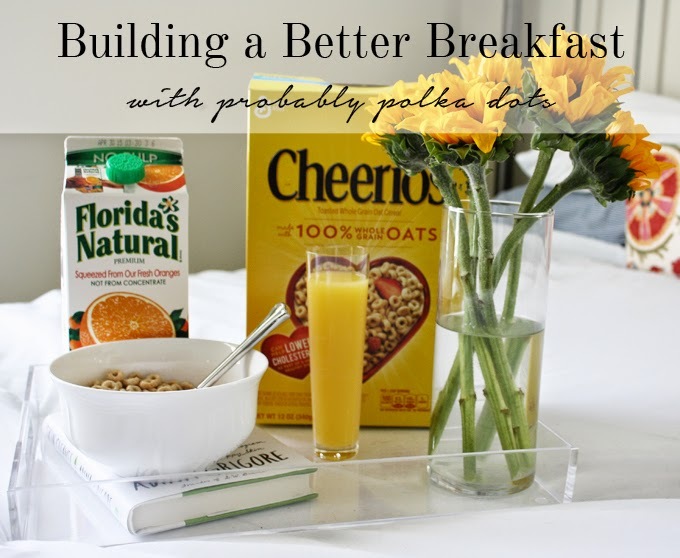 The health benefits of Cheerios and OJ far outweigh skipping breakfast all together. Did you know an 8 oz glass of Florida orange juice gives you 100% vitamin C to help you maintain a healthy immune system? How about the fact that Cheerios’ wholesome cereal is made from whole-grain oats and without artificial flavors or colors. It is low in fat and cholesterol free. And even without the health benefits, the nostalgic breakfast blend will surely put a smile on your face (as it did mine). Taking time for breakfast is imperative. This is where I start listening to my own advice. 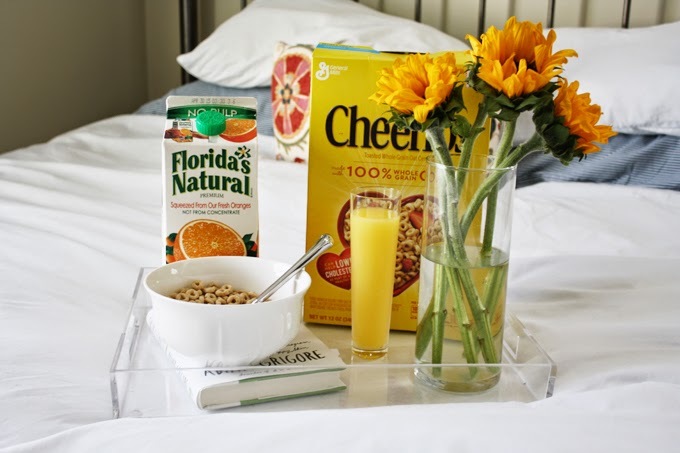 If you can swing it, gussy up your meal by putting it on an acrylic tray and creating a peaceful breakfast in bed. I have to say taking the time to smell the sunflowers and relax really started my day off on the right foot. But if you can't spend too much time on breakfast, just toss those Cheerios in a plastic baggie and pour some milk in a portable container. Add your OJ to a mason jar and head out the door. You can always eat your breakfast at your desk. Ready to try a new routine? Save $2.00 when you buy any one Cheerios 10.9 oz or larger AND one 100% Florida Orange Juice 59 oz or larger from Publix. To get your coupon, just select Cheerios $1/2 on readyplansave.com. Or how about I save you all of your money, and you enter to win the $15 Paypal giveaway below? Deal? Deal. 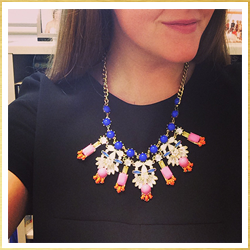 want to be a part of campaigns like this one? sign-up for linqia! Nothing beats a good breakfast - especially when you don't have to think too hard about it! Great reccos! 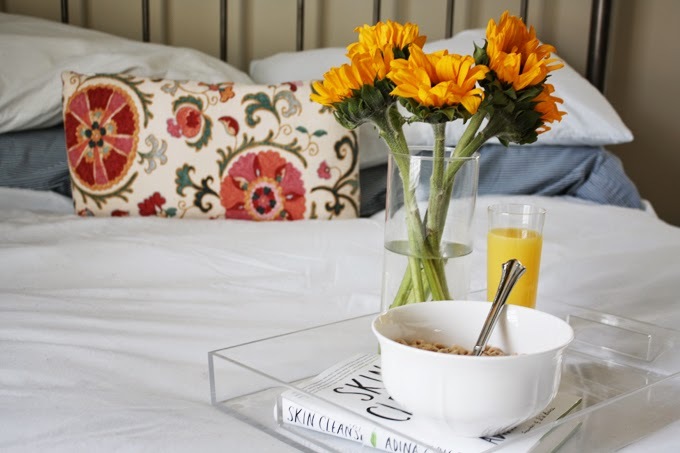 My morning routine always involves cereal & Good Morning America- its a great way to start the day! I like to eat a bowl of cereal with fruit. I usually have a bagel or french toast waffle with peanut butter on it. I had the latter this morning with fresh cut strawberries. Absolutely coffee first. Then, if there is time I have a bowl of cereal with whole milk and fresh fruit. If there is not time for that, I pop two pieces of whole wheat bread in the toaster, quick put my lunch together while it toasts, then spread peanut butter on them and put them together like a sandwich to eat while I'm driving. I also keep a box of dry cereal in the car for munching on on super crazy days when I just need to dash out of the house. We love to have pancakes nd bacon. I start with coffee and then either have oatmeal or cold cereal. My morning routine consist of cereal with fresh fruit and coffee. We try to get as much ready the night before so we can have a nice and peaceful breakfast. We all like to sit down and eat together when we can. Carter loves his Cheerios and we love them for our heart health! I have a bowl of cereal and fruit for breakfast, with some orange juice. I start with coffee and cereal! Occasionally I will opt for a bagel. I have cereal most mornings, or toast.